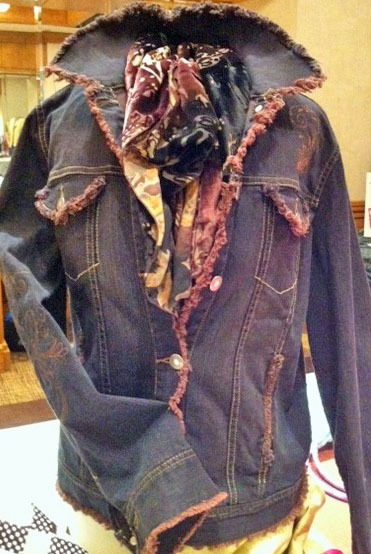 Do you have an old jean jacket that’s just a little outdated and boring? I found inspiration for this jacket in the quarterly publication, Altered Couture. Open all the outside seams with a small, sharp scissors or a seam ripper. Buy your favorite color Rit Dye and dye your jacket in the washing machine using hot water. Follow the directions on the label for best results. Your jacket will fray beautifully. You will need to untangle a few threads and trim after the dying process. If any stabilizer shows on the collars and cuffs due to cutting the seams open, you may want to clip it back and then topstitch the seams back together so your jacket doesn’t keep fraying. 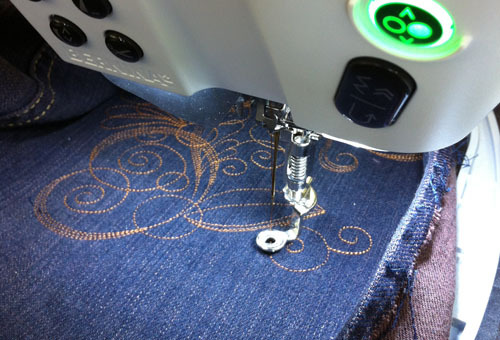 Once you have topstitched the seams back together on your jacket, it’s time to embroider. Choose open embroidery designs such as those in Sepia Petals Crafter’s Collection #82001. 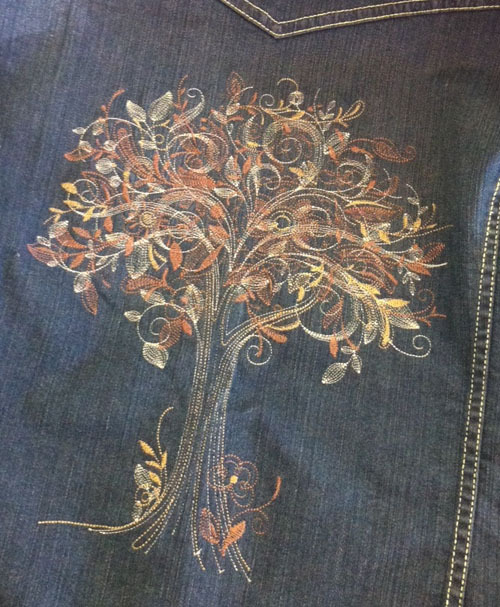 I used the Jumbo Hoop tree design for the back and added some detail on the sleeve and the upper yoke. You can open the sleeve on the non-flat felled sleeve edge. This seam is easier to sew back up and then serge to finish it. I added a burn-out velvet scarf. Find a fabric to compliment your jacket and use your serger to make a two-thread rolled hem on all sides. You won’t be able to make just one of these boutique-style jackets!